I loved Frank Langella in "Frost and Nixon". Loved him in this heartwarming story as well. The setting is a futuristic small town in America where cantankerous senior citizen Frank lives alone. His son is concerned about him and brings him a robot in lieu of placing him in a nursing facility. 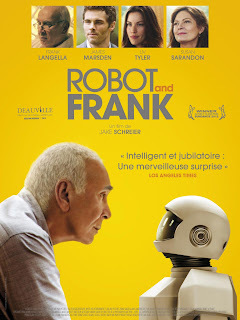 Frank struggles with the robot at first but then embraces him and teaches him to pick locks and help him steal things. The interplay between the two has funny moments. The plot has several surprising twists and turns as Frank and his new friend gets into all sorts of trouble. Even so, this movie is not so much about the future but is more of an endearing tribute to the challenges of aging, senior citizenship and the deep love and care of family. I liked the movie a lot and, on a scale of ten, give it ★★★★★★★. I'm going to put that on our Netflix queue. Thanks for the review! Cool. Let me know how you like it Debby!